Samson Mnisi's last name can be translated as "Rainmaker" and he comes from a family of whom it is said cured drought in South Africa. We met Samson at Flatbed when he came to Austin for the first time in 2000 as an invited speaker for the Austin Museum of Art’s exhibition, “Liberated Voices," which featured works from artists freed from apartheid in South Africa. This was one of the first major exhibitions to explore the work of a younger generation of South African artists who had emerged since the fall of apartheid. Samson Mnisi’s work was featured in the exhibition. A politically and socially active figure in the African National Congress during the apartheid era, Mnisi had participated in the post apartheid regime as a cultural organizer, artist and activist. 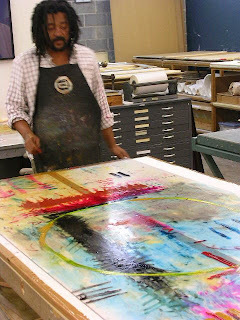 Samson was in Austin for enough time to get restless from not making art, and when he learned of Flatbed, he made up his mind to spend some time in our studio making monotypes as he loved to do in his hometown, Johannesburg. Working on his own, he created a series of highly expressive and iconographic monotypes. When he returned to South Africa, he left all the work with Flatbed to be sold for him here. Fast forward to 2008, Samson was back in the USA and showing in major expositions throughout the world. Circumstances brought him back to Texas and he came to Austin to work on more monotypes. This time he set his sights on our large press to create a cycle of large seven foot by three foot monotypes. Master printer, Tracy Mayrello became his collaborator and they commenced to create a cycle of ten multi-layered monotypes that were incredibly dense with symbolism and color during a period of four weeks. Tracy, who is a master of using the single level viscosity monotype method, layered rolled-on colors with Mnisi's direction. These color fields with Mnisi’s painted imagery worked brilliantly to create the dense, large unique works on paper. Mnisi, using the large near 72" x 36" format, had the perfect, vertical, person-sized surface to create a map-like image that one can almost fall into. Most of the monotypes from this cycle have now been placed with collectors or taken to Samson’s exhibitions, but one belonging to Tracy is a part of the “Advancing Tradition – Twenty Years at Flatbed Press” exhibition now touring in various museums and galleries. It will be on tour until the end of 2013. Flatbed retained one monotype that is reminiscent of the African soil with its historical markings embedded. Flatbed’s inventory also has ten smaller consigned monotypes. They all share the sense of Samson’s land and its history. Studying his prints, the markings start to become as familiar as our own body's lines, scars and marks, creating a beautiful kind of familiarity. His work speaks of paths, history of the land, and the stories that are inherent in the places now in our memories. I would suggest that you call and make an appointment to see these works. We are proud to be able to represent Samson in Austin.